The 2008 financial crisis is the worst economic disaster since the Great Depression of 1929. It occurred despite Federal Reserve and Treasury Department efforts to prevent it. It led to the Great Recession. That's when housing prices fell 31.8 percent, more than the price plunge during the Depression. Two years after the recession ended, unemployment was still above 9 percent. That's not counting discouraged workers who had given up looking for work. The first sign that the economy was in trouble occurred in 2006. That's when housing prices started to fall. At first, realtors applauded. They thought the overheated housing market would return to a more sustainable level. Realtors didn't realize there were too many homeowners with questionable credit. Banks had allowed people to take out loans for 100 percent or more of the value of their new homes. Many blamed the Community Reinvestment Act. It pushed banks to make investments in subprime areas, but that wasn't the underlying cause. The Gramm-Rudman Act was the real villain. It allowed banks to engage in trading profitable derivatives that they sold to investors. These mortgage-backed securities needed home loans as collateral. The derivatives created an insatiable demand for more and more mortgages. The Federal Reserve believed the subprime mortgage crisis would remain confined to the housing sector. Fed officials didn't know how far the damage would spread. They didn't understand the actual causes of the subprime mortgage crisis until later. Hedge funds and other financial institutions around the world owned the mortgage-backed securities. The securities were also in mutual funds, corporate assets, and pension funds. The banks had chopped up the original mortgages and resold them in tranches. That made the derivatives impossible to price. Why did stodgy pension funds buy such risky assets? They thought an insurance product called credit default swaps protected them. A traditional insurance company known as the American International Group sold these swaps. When the derivatives lost value, AIG didn't have enough cash flow to honor all the swaps. The first signs of the financial crisis appeared in 2007. Banks panicked when they realized they would have to absorb the losses. They stopped lending to each other. They didn't want other banks giving them worthless mortgages as collateral. No one wanted to get stuck holding the bag. As a result, interbank borrowing costs, called Libor, rose. This mistrust within the banking community was the primary cause of the 2008 financial crisis. The Federal Reserve began pumping liquidity into the banking system via the Term Auction Facility. But that wasn't enough. The chart below shows a breakdown of how much the 2008 financial crisis cost. The 2008 financial crisis timeline began in March 2008. Investors sold off their shares of investment bank Bear Stearns because it had too many of the toxic assets. Bear approached JP Morgan Chase to bail it out. The Fed had to sweeten the deal with a $30 billion guarantee. By 2012, the Fed had received full payment for its loan. After the Bear Stearns bailout, Wall Street thought the panic was over. Instead, the situation deteriorated throughout the summer of 2008. Congress authorized the Treasury Secretary to take over mortgage companies Fannie Mae and Freddie Mac. It cost $187 billion at the time. Since then, Treasury has made enough in profits to pay off the cost. On September 16, 2008, the Fed loaned $85 billion to AIG as a bailout. In October and November, the Fed and Treasury restructured the bailout. The total cost ballooned to $182 billion. 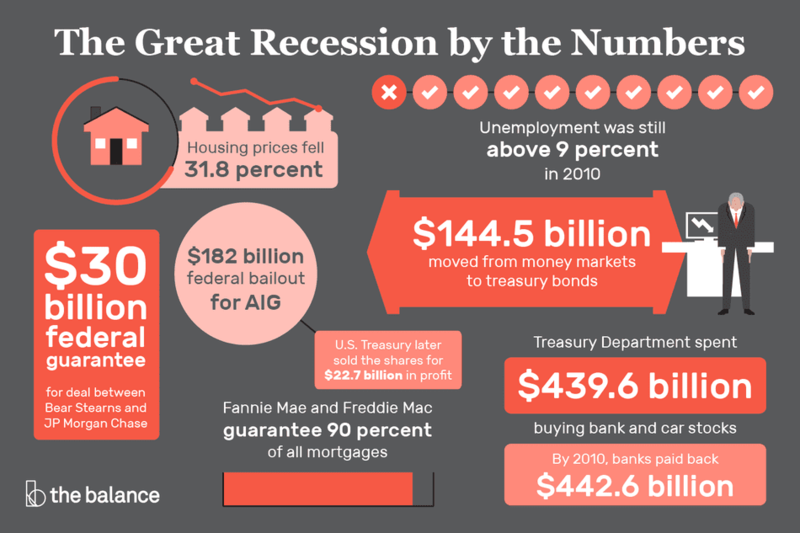 But by 2012, the government made a $22.7 billion profit when Treasury sold its last AIG shares. The value of the company had risen that much in four years. On September 17, 2008, the crisis created a run on money market funds. Companies park excess cash there to earn interest on it overnight. Banks then use those funds to make short-term loans. During the run, companies moved a record $144.5 billion out of their money market accounts into even safer Treasury bonds. If these accounts had gone bankrupt, business activities and the economy would have ground to a halt. That crisis called for a massive government intervention. Three days later, Treasury Secretary Henry Paulson and Fed Chair Ben Bernanke submitted a $700 billion bailout package to Congress. Their fast response stopped the run. But Republicans blocked the bill for two weeks. They didn't want to bail out banks. They only approved the bill after global stock markets almost collapsed. The bailout package never cost the taxpayer the full $700 billion. Treasury disbursed $439.6 billion from the Troubled Asset Relief Program. By 2018, it had put $442.6 billion back into the fund. It made $3 billion in profit. How did it do this? It bought shares of the companies it bailed out when prices were low. It wisely sold them when prices were high. The TARP funds helped five areas. Treasury used $245.1 billion to buy bank preferred stocks as a way to give them cash. Another $80.7 billion bailed out auto companies. It contributed $67.8 billion to the $182 billion bailout of insurance company AIG. Another $19.1 billion went to shore up credit markets. The bank repaid $23.6 billion, creating a $4.5 billion profit. The Homeowner Affordability and Stability Plan disbursed $27.9 billion to modify mortgages. President Obama didn't use the remaining $700 billion allocated for TARP. He didn't want to bail out any more businesses. Instead, he asked Congress for an economic stimulus package. On February 17, 2009, he signed the American Recovery and Reinvestment Act. It had tax cuts, stimulus checks, and public works spending. By 2011, it put $831 billion directly into the the pockets of consumers and small businesses. It was enough to end the financial crisis by July 2009. Many legislators blame Fannie and Freddie for the entire crisis. To them, the solution is to close or privatize the two agencies. But if they were shut down, the housing market would collapse. They guarantee 90 percent of all mortgages. Furthermore, securitization, or the bundling and reselling of loans, has spread to more than just housing. The government must step in to regulate. Congress passed the Dodd-Frank Wall Street Reform Act to prevent banks from taking on too much risk. It allows the Fed to reduce bank size for those that become too big to fail. But it left many of the measures up to federal regulators to sort out the details. Meanwhile, banks keep getting bigger and are pushing to get rid of even this regulation. The financial crisis of 2008 proved that banks could not regulate themselves. Without government oversight like Dodd-Frank, they could create another global crisis.